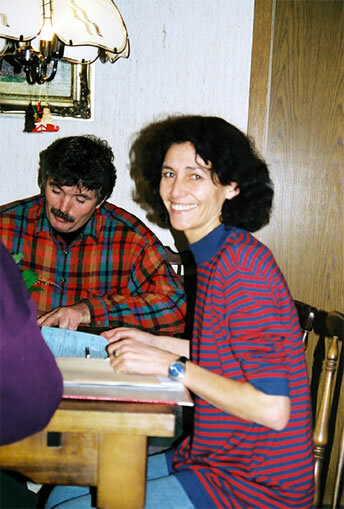 We arrived at Frankfurt airport early in the morning of December 12, and drove to Wuppertal. The puppies were just celebrating their eighth week. 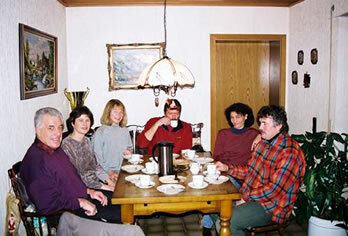 Jutta called Margit, and found out that the puppies had been born in Neuss, at the house of Willi Patten. It was agreed that we could visit the next day, December 13, which also happened to be my birthday. So this was to be my birthday present! On December 13, 1998, we drove to Neuss. Willi Patten is a famous Schutzhund trainer who works closely with the Arlett Kennel. It was a grim, overcast, damp, cold day. But the village of Neuss looked friendly. After all, this was Daskos birth place. We were welcomed by Willi, his wife, and their two children into their house. Willi went to get Dasko. 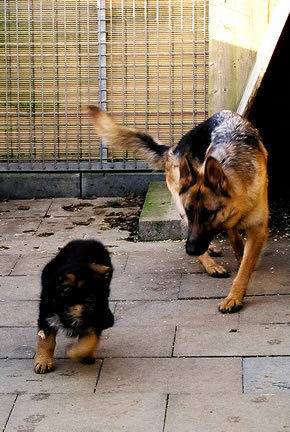 Jutta and I were stunned when Willi came back with Dasko. For an eight week old puppy, he was massive. He exuded the royalty of a German Shepherd Dog and an exceptional harmony. He looked like a miniature version of his father. A miniature Ulk! Willi handed him over to me, and two inquisitive eyes looked piercingly into mine. But then the puppy started screaming! I put him on the floor, where Jutta approached him and petted him. He seemed more comfortable with her, much to my chagrin. The tatooer, Mrs. Patten, Jutta, the regional SV Breed Warden, Margit van Dorssen, and Willi Patten. I was worried that Dasko’s name be spelt correctly in the registration papers. As Margit entered the names in the register, I asked her to confirm the spelling. She said,“D-A-S-K-O. Imagine, they came all the way from America to make sure I spell Dasko’s name correctly!” We all laughed.